RodPrjónar: Talking about presents: Cross stitch, Tintin and cozy candles. Talking about presents: Cross stitch, Tintin and cozy candles. First of all I wanted to say thanks for all the wonderful comments on the bride's pictures... and not only the comments about the shawl but also the good wishes for the newly married couple! Today I won't talk about knitting... again. 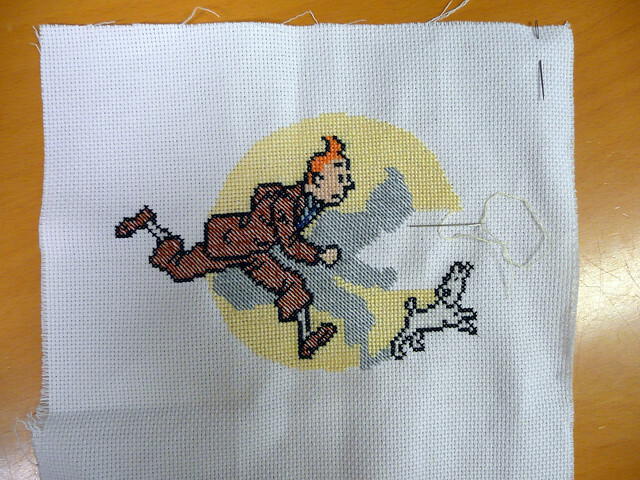 So, having in mind that he likes Tintin I needed to find something related to make a birthday present. Of course the easy way would have been to buy something already made... but that is EXTREMELY boring. So, looking in the internet I found a great idea: Cross stitch. I learnt a little bit of cross stitch shortly after I moved to Iceland (as well as knitting). Moving to Iceland really opened my eyes to handcrafts that were somehow "forbidden" for men according to genre rules that are applied in my homeland. Here, this is totally different. Everybody learns everything. Kids are not put into a drawer with a tag saying but exactly the opposite. They are given the chance to try everything... and that is AWESOME! My experience with cross stitch is not very big. I have done little things here and there but nothing like what I was planning to do now. What I like about cross stitch is how simple it is and the idea of being drawing with a needle. A present NEEDS a nice package. In this case I found this idea in an amazing blog I found while looking around a few weeks ago. There is a tutorial that shows how to make the knot. It is extremely simple and it looks GREAT! I used just some rope that I found at home which worked really well. In my experience, I have come to realized how easy it is to bring some happiness to the people you really care about. It is not necessary to make complicated things or spend huge amounts of money. Something as simple as some fabric, thread, a needle and little bit of time can do the whole thing. My friend was deeply touched by this unexpected present. It is hard to explain the satisfaction that brings to see a friend happy... just to see the shine in the eyes while opening the package has no price! And well, talking about friends and presents now that I am posting this pictures I see in the corner of one of them a present that my friend Kristín Hrund gave me and that I had not shared here with you! We met one evening at my place for dinner, talking and knitting of course. And she came with the cutest thing ever! She made a crochet candle cozy using some of the yarns that she dyes using natural resources. The light if gives if so cozy and calm! It is so cozy that we even took it with us to our last trip to a summerhouse! And to finish, something funny. A few weeks ago Litlaskvis, Linda Björk, an Icelandic knitter that I haven't had the chance to meet personally yet, asked me if I could answer a few questions for a column that she writes on a web magazine that is called Prjónari/Heklari vikunnar (The knitted/Crocheter of the Week). That is wonderful how everyone is encouraged to learn anything they want and that it's not unusual for men to do things like knitting and cross stitch. I love that! It's still a bit uncommon to see men do such things here but I think it is slowly changing. I was in a yarn shop near Los Angeles on Saturday and there were several men there shopping and even a young teenage boy who was sitting and knitting. It was a nice surprise. My mom learned how to knit from her father. Things like that seem rare here now but maybe it will be normal again someday. What a sweet and thoughtful gift for your Tintin loving friend. I really like how you wrapped it and the knot you made. Very nice. I like the crochet candle cozy. I saw some on Ravelry and have thought about making some. Sometimes... well often... I think about how it would have been if I would have learn how to knit when I was a kid. By now I would have had probably many years of experience! But unfortunately when I was a kid I had only the chance to work with wood, make kites, do some painting and that's it. Unfair. But the saddest part of all is that it not really changing nowadays. Mér finnst einmitt skipta svo ótrúlega miklu máli að ala drengina mína þannig upp, að þeir geti gert allt einsog allir aðrir - að stelpur og strákar geti og megi gera sömu hlutina... skemmtilegt að þú skulir vera að skrifa um þetta! Líka skemmtilegt þetta með spurningarnar og svörin! Það var svo gaman að lesa þetta! I wonder why is still not well accepted in the cities, that, men knit. I grew up in México, and I used to go with my mother to the market place, and we sometimes saw native boys, probably Huicholes, knitting woollen gloves and hats to sell. Usually there was circle of people about them watching. I used to admire how fast they knitted, and I could had watched for hours, if my mother wasn't in a hurry. I remember throwing temper tantrums when it was time to leave. The adult men, knitted also sweaters, and nobody raised an eyebrow, "they were natives". But God forbid if a urban man sat in a park or in the front of his house knitting, it was just not done. Those native boys were my inspiration to learn to knit, and since my mother, did not want to teach me, I don't know her reasons, I taught myself when I was 9 years old; but I never reached the native boys's kitting speed. My late husband, was German, and he knew how to knit, and we knitted together our first child's layette. His older brother was also a closet knitter; he knitted for his family, but his wife got the credit. The only knitted present I have received, was done by a friend, a man. PS. Sorry to be so long winded. Thank you so much for sharing with me your childhood experience with those Huichol boys... that is truly inspiring. The thing about men and knitting is really strange... for me has been kind of liberating to be able to make things I always wanted to try. It is funny that even here in Iceland guys that knit get a lot of attention because even though everybody learns how to make there are very few guys that continue knitting after school. I love the cross stitch! I don't think Tintin was especially well known here in the US before the movie came out last year, but I used to read the comics in a children's magazine when I was young and always loved them. When we went to Montréal a few years ago, I found some Tintin books (en français, naturellement) and bought a few, even though my French is very poor. I always thought my family was a little unique, because they never discouraged me from trying sewing or crochet or knitting or cross stitch or any other craft I wanted to learn. Having been able to learn to make things, though, I think every child should be taught how to make their own clothes, grow their own food, and if they need to, build their own shelter. Outside of some doomsday, post-apocalyptic survivalist scenario, I think it helps children develop good critical thinking skills and self-confidence. I totally agree with you about learning how to make our own things. It is somehow something so basic and that we are unfortunately forgetting. I think that in addition to helping kids develop critical thinking skills and self-confidence, making their own things teaches them also the real value of things... that things come from somewhere and that there is always an effort behind the things that we all now take for granted! Forgot to say, that, I never heard of Mummins. Maybe they have different name here. I used to watch daily, Tin Tin, with my grandson after school. He is now 19 years old, and he still likes Tin Tin. Qué bien te ha quedado el cuadrito de Tintín, felicidades, eres bueno en lo que te pongas a hacer. No me extraña que te anden entrevistando (¿Te hemos de llamar Don Rodrigo?jejejeje) En España sí que se conoce Tintín y tiene bastantes seguidores (Yo soy más de Astérix) Lo que no me suena es el otro que dices. Aunque quizás sea ignorancia mía. Un abrazo. Muchas gracias por visitarme y por tus generosas palabras. Será que todos los aficionados a las manualidades somos más o menos bien puntillosos en todo los que hacemos? Al menos a mí me gusta que las cosas que hago luzcan bien, jeje. .. ohhh.. ¿¿ escribirás ahora?? :) que rico !! jejeje el px te ha q uedado divino,,, y atrasada debo decorte que la novia se ve hermosa con el chal,,, felicidades en su futura vida :) saluditos grandes d esde acá!! En Barcelona si que conocemos a Tintín, tuve la suerte de ver una exposición en el Museu Marítim de Barcelona y leer toda la colección (un amigo me prestó todos sus libros) como siempre impecable y un buen regalo. Felicidades por la entrevista !!!!!!! y pensar que solo hace 3 años que tejes, no quiero ni pensar lo que podrás tejer dentro de 30 años. Pues yo todavía ni siquiera he visto la película! Tengo que ponerme al día con Tintín! La entrevista... jeje. Me hizo mucha gracia que me contactaran y bueno, no puedo negar que me halagó mucho. My heart skipped when I saw your cross-stitch. Then it skipped again with the present! 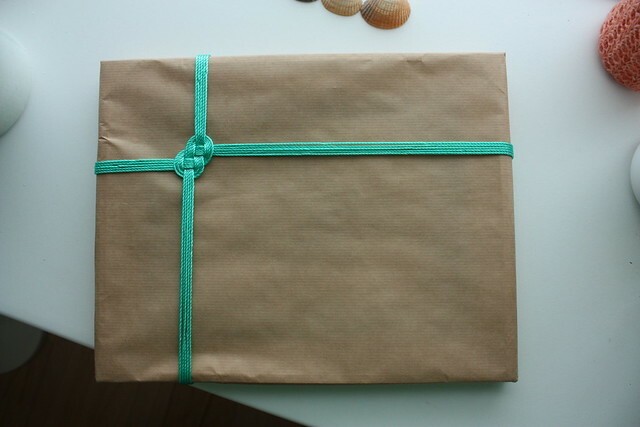 Your wrapping turned out so beautifully! Also, I love your enthusiasm and kindness -- your posts make me smile every time! I am so glad you liked my cross-stitch :) And it makes me even more glad to read that my posts make you smile!! Te felicito por tu trabajo...es precioso todo lo que haces. Tienes una sensibilidad especial para tejer y tu blog me ha encantado. What thoughtful gifts. You are lucky to have such wonderful friends and of course, they are lucky to have you as a friend. 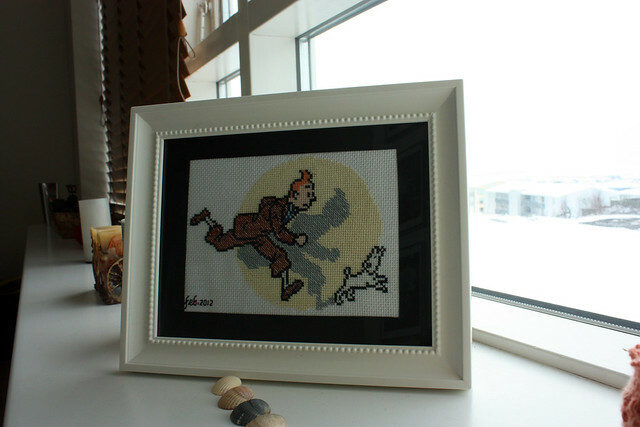 Love your tintin cross stich picture, and the gift wrapping is lovely. I looked on the linked website for that knot you made because I was wondering what the name of it is, but couldn't find it. Do you know its name? You did a great job with the wrapping. I love the somplicity of it and the colors. The candle cozy looks so pretty with the candlelight behind it. I bet it makes for a nize, cozy atmosphere. I'm hoping to read the column about you soon. First I have to find out how to access the Google translator and then how to make it work. Someone wrote to me recently using it to translate her writing before sending to me, which was nice. The pattern is brilliant! It looks exactly like him! About the knot... no idea what it is called, hehe, but doesn't it look great for wrapping presents! It looks so neat and simple! The candle cozy is AWESOME! It is sooo cozy! hehe. Rodrigo, siempre un gusto leer tus crónicas. Pienso que eres una persona muy generosa. Y lo has demostrado con creces en los diferentes post que te he leído. Pero decir que la traducción de Google es decente es de ser muuuy desprendido :-) y hasta espléndido. Siempre es un gusto "verte" ya sea por aquí o en Ravelry! Jaja, la traducción de google es rara... cuando le di una mirada hasta me dio risa en algunas partes... pero bueno, es lo que hay, no? You really are a multi talented guy! I love cross stitch- in years past it was one of my great passions. I've seemed to have put it aside as of late-- as I'm so obsessed with my yarns right now- but I love it just the same. Your gift for your friend is really priceless. You are so right- a gift from the heart/ especially with your talents-/ is the very best kind. I can only imagine how thrilled he was to unwrap this gift! Love the wrapping too! Cross stitch is awesome! So simple but so beautiful! I don't do cross stitch very often but every time I do I REALLY enjoy it! If you could have only see my friend's face! That was priceless! He was almost in tears! Thank you for visiting me Vicky! Que lindo te quedó el bordado y la presentación del regalo, tu amiga de verdad tiene mucha suerte :) y bueno tu también al recibir el lindo presente a crochet que te hicieron. La entrevista buenísima! (sin comentarios sobre el traductor google jeje, pero se entiende jeje). Un abrazo y muchos cariños, que tengas un excelente fin de semana. qué lindo Rodri el cuadrito!!! un besazo, y feliz domingo!